This church campus came to us to theme out the kids wing. We were told the theme of the room would be called "The Kids Club House" and they wanted the room to look like it was designed between realistic and cartoon. After a few discussions on designs what we came up with was the location where kids in the neighborhood would hang out in the woods. Featuring four tree forts each looking like they were built by kids themselves, crooked boards and mix matched paint for a fun look. This popular amusement park came to us to build them their new parade float for the "Everyday Parade" featured in the park. This float represented everyone's birthday in the park that day. Built over top of a golf cart, this float was built with an inflatable top to fit through a garage door. The paint job was extremely important so the hard structure of the cake and the balloon looked seamless. Our studio won the bid to design and build the Galleria at Pittsburgh Mills decor package. This massive 2,100,000sq. ft. mall needed a decor package that heavily decorated the entire property. We were instructed to make each separate hall and courtyard feel totally different from one another. The fashion "Macy's court" featured a 25ft tree decorated in red balls, pine cones, and berries. Each hall off this courtyard featured three foot lit snow flakes that gave the whole area an upscale wintery feel. The food cart featured silver trees decorated in pinks and purples. Overhead silver vertical garlands hung among chandeliers made of iridescent clear plexiglass. The kids court featured and explosion of giant candy hanging from the ceiling, 10ft lollipops, 9ft candy canes, and gum drops filled the ceiling in between traditional light curtains. Of course the focal point was "Santa's Magical Hallow." This 50ft long display was designed to have guest walk through a wintery wonderland filled with snowy lit trees and 35 animated woodland creatures. Arriving to Santa, guests entered a 20ft hollow log that Santa called home. Kennywood Amusement Park hired our team to build their new signage for the new Cosmic Chaos ride. This sign spanned 14ft in width and was built on a steel frame and cemented in the ground. The Mohegan Sun hired our studio to design and build their new holiday tree. Referred to as the "Sky Tree" this tree was designed to represent elements that the Mohegan Indians would use in their day to day lives. Winding up 25ft, the tree was constructed with a welded steel frame covered in faux deer hide and leather strapping. The center pole was hand sculpted to look like a birch tree commonly seen in the state of Connecticut. Decorated with over sized ornaments ranging in size from 24in to 45in, each ornament was constructed using only natural materials. Cranberries, pebbles, seashells, hand beading all came together to complete the finished pieces. Custom molds were then fabricated and vacuum formed, than painted with a high chrome finish to represent silver jewelry. The piece finally came together sitting on top of a rotating base and spot lit in the center court of the casino mall. The Splashplex opening its doors in 2015 hired our studio to dress up their new waterslide area. The client wanted a western town built with the idea that it had to have bright bold colors. After a few back and forths we ended up with this pastel color pallet. The facade buildings were attached to telephone polls that were cemented in the ground covering the side of an aluminum building. Three additional buildings were disguised with fake exteriors that looked like a jailhouse, horse stable, and coal mine. Additional mural work completed the theme of this area of the park. 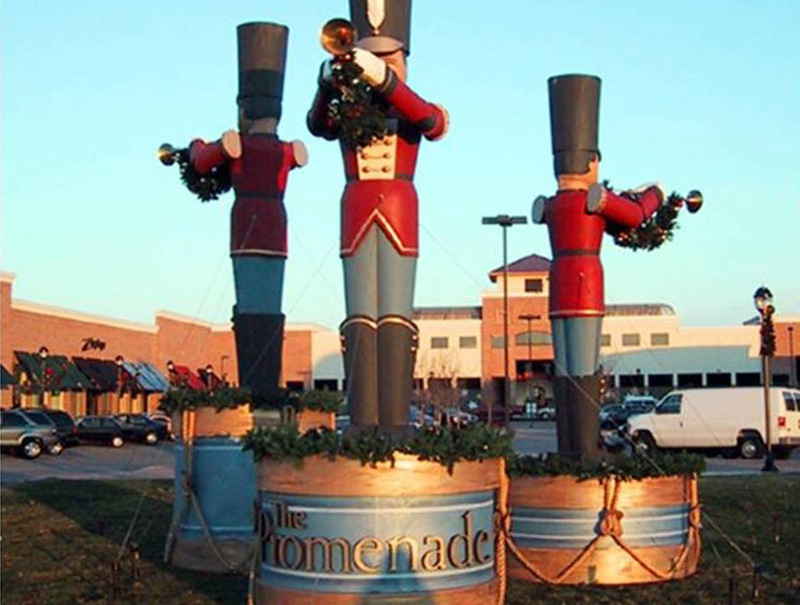 Our studio was hired to design, build and install the Promenade at Sagemore's holiday decor package. The client was open to ideas, but wanted it to look decorated during daytime hours, and not just at night when the lights come on. What we decided to do was design and build these 15ft tall toy soldiers that would be placed throughout the entire center. Displayed in the courtyard, flanking the doorways and greeting you at the entrance way the soldiers did the job. We then carried the theme of gold trumpets with swag garlands hanging from 82 lamp polls. In the center court a castle was built for a great backdrop behind Santa. PNC Bank hired our studio to design and build out their new holiday windows. We designed and built a victorian village with every attention to detail. Each house stood approximately 8ft tall with a total of seven houses needed to fill this massive window in Center City. Ten pines trees of various sizes helped fill in the area and made the houses fit into a wintery scene. University mall came to us so we could build their new Easter display. This display had a small foot print, so we wanted to make it impactful by using the height we had available to us. We designed and built this whimsical tree that reached up 18ft tall. Giant oversized vegetables where placed around the tree to help complete the set. The Promenade at Sagemore hired the Working Designs studio to design, build and produce their fall fashion show. Taking place under two 40x80ft frame tents, the tents were decorated for the fall inspired season. Our creative team completed the entire event from start to finish. Lighting, sound, and of course the decor all made for a huge successful event that brought in thousands of shoppers for the weekend event. Innercity Shopping Mall, a Canadian based shopping mall, came to us to build their new Santa display. They told us they wanted a ginger bread theme, so we gave them exactly what they wanted! An explosion of ginger bread men in a whimsical setting. Featured around a 25ft tall tree, ginger bread men were climbing up and around the tree decorating it. On top a gingerbread man was holding the star like he was putting it on a tree, while other ginger bread men were looking like they were making a mess with their cooking ingredients. A giant candy archway and additional overhead pieces completed the package.